Dr. Marvin Chodorow obtained his doctorate in theoretical physics from MIT in 1939. His knowledge of solid state theory led him to work at the Sperry Gyroscope Company's research laboratory from 1943 to 1947. His work there with William Hansen, Edward Ginzton, and Sigurd and Russell Varian on the Klystron Project shaped the rest of his career. 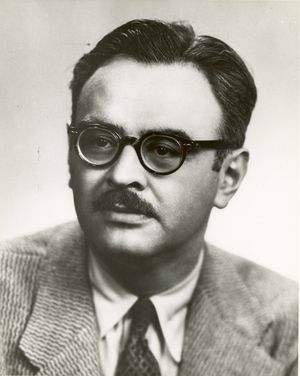 In 1947, Chodorow moved to the Stanford University physics department to continue his association with Ginzton and Hansen as well as his work with klystrons, microwaves, and accelerators. He became a research associate at the Microwave Laboratory and later the director of the Ginzton Laboratory. After 1962 he headed Stanford's new Department of Applied Physics. The interview describes Chodorow's work with microwaves, Klystrons, and particle accelerators during and after World War II. Chodorow discusses his experiences, first at the Microwave Laboratory and then the Ginzton Laboratory, and reminisces about his work with Hansen, Ginzton, and Frederick Terman. Interview # 045 for the IEEE History Center, The Institute of Electrical and Electronics Engineers, Inc.
Marvin Chodorow, an oral history conducted in 1984 by A. Michal McMahon, IEEE History Center, Hoboken, NJ, USA. This is an interview with Dr. Marvin Chodorow, retired professor of physics and lab director at Stanford University. After undergraduate studies at the University of Buffalo in New York, Dr. Chodorow won a Ph.D. in physics from the Massachusetts Institute of Technology in 1939. After teaching at Penn State and the City College of New York, he went to work for General Electric until in 1943 he joined the Klystron Project at the Sperry Laboratories on Long Island. He went to Stanford University in 1947 as an associate professor of physics, and as a research associate at the Microwave Laboratory, then directed by William Hansen, and later by Edward Ginzton. Chodorow became the director in 1959, and after 1962 headed the Department of Applied Physics. Let us begin! We can begin in no better place than education, I think, in terms of your training. You were doing that too? Yes. But then I got a job through people I knew at Sperry Gyroscope Company, which has a research laboratory in Garden City on Long Island. I got there in 1943 and left in 1947 — but my whole connection with Stanford and why I came here and so on was the result of my going to Sperry, because Hansen and Ginzton and the two Varian brothers were all there. They moved that whole Hansen project, the Klystron Project. As you may know, Sperry bought the commercial patent rights to the Klystron. When the war came they moved the whole group to New York City and that's where I met them. I didn't know them before I met them, Hansen, Ginzton and the two Varian brothers, there. Now, were you with that project, or just learned about it? No, I was in that group. Oh, you were in that group? Yes, I was in that group — Ginzton was the supervisor of about three laboratories and I worked in one of them. That's how I met them. I worked for him indirectly, and the line of authority was such that he was head of three laboratories. One of the laboratories I was working in, but in microwaves. So I changed my whole field at that point and that was the single most important event in my life, because, by going there, I became a microwave expert. I worked there on microwaves and Klystrons particularly and then at various times after that. Hansen had been a professor here, a professor or associate professor of the physics department, and he had a leave of absence and came back at the end of 1945, partially because the war had ended and his function at Sperry was no longer so important. Also he had been ill, and the climate was better here. So he came back here and started a research program. Then he offered Ginzton a job in the physics department, and Ginzton came out here either in September or October, 1946. Then they offered me a job in the physics department, and I came here in March of 1947. At that time they had already started a program to do research in microwaves, research of all kinds on microwave plumbing, if you know what the word plumbing was used for — waveguides, coaxial lines, generic [slide rule] plumbing, microwave plumbing, and microwave experiments of various kinds. In particular Hansen had started working on an electronic accelerator at Stanford, I think before Ginzton came out, and he had ideas about the accelerator he was going to build. It was very much like the bigger one that was built later and the one that's at Slithe(?). There were a number of people at various places in the world who had similar ideas about building an accelerator. He had started to build one. There were people in England, and Slater at MIT had also, during the war, gotten into microwaves. He started building an accelerator, and Hansen did, and he was rolling along. For an accelerator you need a high-powered microwave source, and everybody at that point was going to use a magnetron. A magnetron is a device invented during the war; it was THE dominating source of microwave power for radar. It was a very efficient device, very compact; it dominated the whole radar business. It had all these advantages. It was efficient, small/compact, it could put out very high power a megawatt — that was relevant to us. So Hansen, like everyone else, was going to use a magnetron as a power source for the accelerator. And he did, he built one, but when Ginzton came out, he said, “Why don't we look at the possibility of using a Klystron as a power source?” During the war, there was one form of the Klystron called the reflex Klystron, which typically was a source that put out five-ten-twenty milliwatts and was used as a local oscillator. With a receiver, you receive the signal, you mix the signal with some other signal that you have, and the result of that mixing device is how you get information from the received signal. You need something to be the source of the signal you'll have, called the local oscillator. You mix it and you get the difference frequency which reduces the received signal to something you can manipulate. So that was a local oscillator that was very commonly used, but it was only a few millowatts and was a form of Klystron. Ginzton said, “Look, the original Klystron was an amplifier. “ There was some work done in England before the magnetron was invented where they got up to five or ten kilowatts with the Klystron amplifier. Actually, at Sperry we had worked on a project for something like perhaps a ten kilowatt amplifier. The word amplifier is important, because a Klystron, unlike a magnetron, can be used as an amplifier. You put a signal in, and you get the same frequency out in an amplified form. And a magnetron cannot be used as an amplifier? No. Many years later people invented something that behaved like an amplifier but was not really. It gave you the same frequency but was not a faithful reproduction. The magnetron is efficient — it can give you a high power, but could not be used as a straight-forward amplifier. So Ginzton said we should look at whether we could use the Klystron. If you can build an amplifier, as you inject the signal and get the same signal out at higher power, and you maintain the phase to represent the signal, you should come out with the same rhythm and so on. It was known the Klystron could do that, but he wanted to see if we could build a Klystron for VERY high power, and then we could build a very large accelerator. And that's the beginning? Ginzton stays with that for a long time, the idea of more high power? Ginzton suggested to Hansen that they consider this. They looked at how if they did this, if they could raise the money, they would need more manpower, and then they invited me up, and that was the principal reason. I hadn't done a lot of work in microwaves, and I had never worked on Klystron amplifiers; I worked on reflex tubes, which are very low power. The one I worked on at the end of my stay at Sperry was not ten milliwatts but about one-half a watt. Reflex tubes of that kind dominated the communications industry for many many years. They were using all microwave relay links, and they're still using them. It turns out that once a device is built it has a life of its own. I'm very surprised that Varian still sells thousands of their systems per year for this purpose; it's used as a microwave relay link. Many of the communications of this country are carried by point to point relays. You send it from here to a point thirty or forty miles away, and then it's sent out again. You have to have something when you receive the signal that will demodulate it and relay it out. The reflex Klystron, not the ten milliwatt one, but for a one-half watt, is an ideal device for various reasons. I had worked on that for the last two years at Sperry, and it is much more difficult to get the right characteristics with these ten to twenty megawatt devices, and I was successful. In that sense I was a Klystron expert on something that was different. So they invited me out as an expert on Klystrons to work for them on this program. When I came out in March of 1947 we got money to look into the possibility of building a very high-powered accelerator, on very high voltage. Compared to everybody else, we were going to try to develop high-powered Klystrons which are amplifiers. Then we could build a long one. When we eject power here from one Klystron, the electrons are accelerated and they go into the next section. The power gets depleted and detenuates, and in the next section you eject power from the second Klystron, which will be the same frequency and you can control the phase. When the electron gets in here, it sees a wave which is exactly like the one it saw there, exactly the same phase. This means that if it enters this phase at the crest of the wave it will enter that one at the crest, and so on. But for that you need amplifiers, and to get a lot of acceleration you need very high-powered amplifiers. So we started this ambitious, or sort of ridiculous, program to try to build thirty megawatt Klystrons. We finally got thirty megawatts but the actual accelerator used was at about twenty. This is what we started; we got money for it, because it was obvious that if you could build these kinds of Klystron amplifiers, you could also build a long accelerator because you could eject power periodically. Now you were with the Microwave Lab? The Microwave Lab was founded at the same time? We had appointments in the physics department. I was a physicist by training, though I'd become a hacker at electrical engineering. During the war, all of radar countermeasures got into branches and developed new ideas in electrical engineering, electrical devices and transmission systems, where the somewhat unsophisticated theory was good enough. Before the war electrical engineering, radios and so on could get by; if you knew about radio engineering you didn't have to know Maxwell's equations, and you didn't have to know about wave guides, and you didn't have to know a great deal about antennas — you knew how to make an antenna, but you didn’t have to invent all the various complicated structures. It is true that during the war the Radiation Lab at MIT was filled almost entirely with physicists. Hansen, for example, was a physicist, and he was very versatile, very bright. Six months or a year before the Klystron, he invented the cavity resonator. The cavity resonator is an empty metal box. You can get resonances in it, and you can get electromagnetic waves to bounce around. If you pick the right dimensions for a given frequency you can build a very, very large amplitude. This is basically the same idea as an organ pipe. In an organ pipe, you pick the dimensions of the pipe, you excite it and you'll get a loud sound. It depends on the length, and whether the organ pipe is open at both ends or closed at both ends, for a particular tune. Exactly the same kind of theory can be done with electromagnetic theory. I'm full of this information because I gave a talk just a few weeks ago and I looked up this patent. They did this because the physics department at that time was doing work in X-rays as physicists, and they wanted to have a higher voltage source of X-rays than they had. They had something like 200kV, which by present standards is laughable — 200 kV, and they wanted to make it 400kv. The standard way of doing it was expensive, and they had to buy things. The question was, could they invent some way of doing it? Hansen invented the cavity resonator, and this is the patent that was used. He showed various shapes of boxes, but one was a rectangular box, a cross-section maybe twice the size of that table, and if you put the radio tube on one corner and connected it properly you could produce electromagnetic waves inside the box which would bounce around and build a very large amplitude. If you injected electrons through the top, you would see an electric field which accelerated. That is important, because that idea of a resonator had tremendous influence on the Radiation Lab. That idea of a resonator was used later by the Varian brothers with Hansen when he invented the Klystron. Whereas Hansen invented the idea of accelerating electrons with his box, with a shape that could calculate his frequency, in the Klystron he used the same shape. For various reasons it was intended in the middle, so you take a round resonator and indent it in the middle so that in the center the spacing between the top and the bottom is much smaller. Is that the bunching principle? They use the resonator to do the bunching. If you take a box and squeeze it so it looks like a donut as if you started to produce a hole but you don't go all the way through, you're left with something that looks like that... The electrons go through a grid, and here you get a field that accelerates or decelerates the electrons. Two of these, one above the other, constitute a Klystron. The Varian brothers had come to Stanford with the ambition to invent a high-frequency radio tube. Radio tubes up to that point would go up to maybe 500 megacycles but not higher, and for various reasons having to do with either aircraft navigation or radar, they knew that high-frequency radio tubes would be important. You may have been taught that one of the brothers, Sigurd, was an airline pilot. He flew back in the late 1920 for PanAm and he had to go land in Mexico City, which is a very difficult city to land in because you have to go over mountains, and with no navigation aids it was precarious. You knew that you could have radio waves, send them out and use them for guidance. When they came here, Russell thought of using Hansen's resonator. Hansen was going to accelerate electrons, but he thought if you can accelerate you can decelerate, so in about a year they invented the cavity resonator and the Klystron, both of which were the key elements in the accelerators that we and other people now have built all over the world. I got to all of this from the fact that physics was very important for electrical engineering and the best radio engineers are physicists, because all radar involves the microwave, so you had to learn a whole host of things that electrical engineers did not know, by and large. The physicists could learn them because of Maxwell's equation. Their training was much more suited for this, and the Radiation Lab was full of physicists. But Hansen, who had been working on cavities and Klystrons and so on, was already an expert before he came East. He was working in Sperry in Long Island and would go up to Boston for two days a week and give lectures there for their senior staff trying to educate them on microwaves. They were famous Hansen lectures, showing them how to use what they already knew, how these things applied. He'd been working with hardware where the others had not. Yes. He also had some experience because the cavity resonator and the Klystron were invented in 1937. The Radiation Lab wasn't started until 1942, so he had been working on radar problems and waveguides in the country; maybe a handful of people knew these things. There was Hansen, a man named Barrow at MIT who was one of the early workers on wave guides, and Schelkenoff and Southworth at Bell Laboratories. I don't think there were as many as a dozen people who were trained as physicists or mathematicians or maybe sometimes electricmen who worked on these problems of microwaves, where you had to apply certain things which physicists knew. So Hansen gave these lectures, and there were four volumes of lecture notes. There are a few copies. Ginzton has a set, I have a set, and there may be a set in our library. When Hansen came back here, all the ideas for an accelerator had been invented during the war. You could easily take his cavity and put a number of them back to back, instead of accelerating it through one cavity. All you had to do was synchronize the cavities, so that the power would flow from one cavity to another and you'd arrange them properly so that when an electron went from here to here, you'd always see the same kind of accelerating field. But then to get the power and do this many times, this is possibly where using Klystrons came in. I came here in March 1947, and we started to work. The first thing was that we looked [to see] whether it was at all possible to develop Klystrons which ran at ten, twenty or thirty megawatts. If you could, then they were amplifiers and you could use a series of them. You could have a ten-foot section that was fed by one Klystron, then the next ten-foot section, and you could send the electron beam down all of them. Other people had tried to do the same kind of accelerator. For example, Slater, whom I did my thesis with on solid state, tried to do this with magnetrons, using them as oscillators, but [he] tried to lock them. That's much more difficult than it is to synchronize them, and in principle it's possible but it's very difficult, and practically, it is not a solution. He gave up after a number of years, particularly when he saw what we were doing, with trying to use magnetrons, because by then it was quite obvious that the way we were doing it was the way to go. In 1947 I came here, and by January 1949 we had our first successful Klystron operating — two years. We got fourteen megawatts. There were still practical problems in how long they would live, arcing and sparking. It may not have been all that one wanted, but the fact that we could produce that kind of power meant that we could quite confidently go ahead with building a long accelerator. By this time, long before this, Hansen had already built a four foot accelerator that gave five megavolts that was run by one magnetron. For one section you could feel with the magnetron that the frequency changed although the accelerator still worked. The frequency was different, and the synchronism was not perfect, that didn't make a difference — but the synchronism had to be perfect if you were going to run electrons down three or four hundred feet. So, we knew the whole accelerator theory, how to build the accelerator sections, what the dimensions should be, and the construction techniques. Once we had the Klystron amplifier we could go ahead, and so we did build one. I can't even say when it was finished, because it was sort of built section by section, and we added some people to the faculty, both Hofstetter and Penofsky, who were high-energy physicists, to try to use the machine. They started using it, and if it was running at 500 that was good enough. They could use it at 500, or they could use it at 600 or 700, and since it was a linear machine you could always take whatever you would get out of it. You got 500 or whatever electron measures you got, so there were a lot of experiments done with that machine. Was that the prototype called Mark III? Mark III! The reason we used that nomenclature — it was Hansen's idea — was because during the war the Navy always used that kind of nomenclature. If they had a piece of equipment and then they modified it, they would call it something Mark I, Mark II, Mark III. It was a kind of serial number. I don't know if it was a joke, but the first machine he built he called Mark I. The first section of the big machine we built was Mark II or Mark III. And that was the one that was finally useful, Mark III. I don't know which was Mark III. The accelerator was built in ten-foot sections, so you'd run electrons through them, and then it would be joined to the next section, so they had a common vacuum. You would just assume the electrons would go through, where they weren't accelerated, but you might have a vacuum pump there or something else, or even monitor whether the electrons were going straight, and then go to the next section. There it would be accelerated again, and all you had to do was to make sure that the Klystron was feeding the next section, that [it was] properly synchronized with the previous one. You might have to play with some controls, but that could be easily done, because to synchronize it, the frequency was the same. You'd have had to have something called a phase shifter, and you could just change the phase and that was easy enough to do. You'd accelerate it, and then you'd jiggle the phase of whichever section and look at the electrons that were coming out and see what you had to do to get the energy up, to better the magnetic field to maximize the energy. So it was easy enough once you had amplifiers. You could add one section after another, and there were ways of comparing the signal, comparing the phases that come out. All of these are not trivial, but no major inventions were involved. Once you had the Klystron amplifiers, then you knew you could build a very long accelerator, because it was merely a question of feeding this section, then the next section, and so on. So we built one section after another, and added them, and the accelerator became longer and longer, and at some early stage people started using them. Whatever was available, the next section was being built, the next Klystron. They could use this thing, accelerate electrons, and take them out. If you had a region, say 350 feet long, that you were going to fill with an accelerator, and the target area was at the far end, before you got the last hundred feet you could still put in just a tube, a hollow tube. The electrons would come out the last section of the accelerator, go down this hollow tube into the target area, and you could do experiments. If we said we wanted two or three days to install another section, they would have to stop their experiments and chop off ten feet of tube. We would put in the accelerator section and now instead of 300 million electrovolts you would have 35. So you could really build this thing piecemeal and use it piecemeal. If you had 150 feet of accelerator, it would give you whatever energy you had at that point; you could do experiments in that thing, using that same target area which was designed to be the end of the building, and the electrons, instead of being accelerated, would go through the last hundred feet just through the hollow tube. It seems as if, in one sense, it was always finished. It's just a question of how much you added. That's right. Once we showed we could build accelerator sections with the right tolerances. Because the accelerator sections had to be with right precision, you had to build a ten-foot section where these disks had to be placed with controlled spacings of better than a thousand. There were holes in it that had to be made with diameters better than a thousand, the hole had not sharp edges, but sort of rounded edges. Those had to be made right, because if you didn't make them precisely you would perturb the wave a little so the phase wouldn't be right. And that could cause a big change...? It's a small change, but it would make a tremendous change because then the electrons wouldn't come out with the right energy. Then there would be problems; there might be reflections of the energy, so the question of how you build these things was crucial. Hansen was also a great contributor there, because in addition to being a great inventor and mathematician, he was a superb machinist. His father, I think, owned a machine shop. Well, Hansen became ill; he died about the middle of 1949. He lived long enough to see that we had a successful Klystron. Ginzton and I were mainly involved in the Klystron. Hansen's involvement became more and more tangential. He was still involved, but he became ill in the last year of his life. He had this bronchial ailment, and he had to have oxygen. He designed an oxygen tank that he could carry in the trunk of his car so he could drive and use his oxygen generator at the same time. He would show up at the lab about once a day, which he should not have done because he was not in good physical condition, but he'd show up and talk to people. He designed his own portable oxygen tank: Hansen would always invent something. He was a genius. That could be seen as sad in one sense, but it could be seen as a triumph in that he was active right to the end. I remember him driving up — he wouldn't get out of the car — it was a Roadster or something. He'd talk to people and drive home. But I do know that he was assured that because we had built the accelerator section, we had built the successful Klystron, so he could see his project was ready to go ahead. Ginzton took over as director of the laboratories; he and I were involved in the Klystron. I was involved in the accelerator but not to the extent he was. The accelerator required a lot of technical management. We had a big staff, a lot of students who were very good at decision making. I don't think it was just managing. It's not managing like when you run a business, but making decisions about when you go ahead, and when you don't go ahead, and when you've done enough research, and when you stop trying to improve it. It's called research management these days, and that's a whole kind of field in itself. How do you think about that? Our temperaments are different. I learned a great deal. By background, I was a physicist, and also by temperament. I would always want to do a last bit of polishing on something, Ginzton and I had been friends for many years, but we'd disagree on many things having to do with when to decide to build something, whether it's going to work as well as you know how to make it, just to see if you're going to come up with some unexpected problems after you've built one. I sometimes see myself as different from a journalist in that respect; I want to keep polishing, looking for that other piece of information. I think I learned a great deal. I learned technically, in terms of being a physicist, but I think I also learned something about managing, because I realized that while I wouldn't say Ginzton was always right, there were things that my temperament had to overcome. So the Microwave Lab continued under Ginzton's direction, but you were the head of something called the Ginzton Lab. Around 1955, which was only six years after we'd built our first successful Klystron, the accelerator had been running very well. The people who were using the Klystron decided, “This has been working well so, let's try to get ourselves a bigger one." So they started a study at Stanford trying to see what it would cost, and they went to the government with a proposal, for a bigger machine, namely two miles long which was going to cost 125 million dollars. In the first place, they'd been using our machine very successfully. A lot of fine experiments had been done. It was obvious that that machine compared to all the circular machines had an independent role. They didn't suspect at that time how valuable certain things would be. They had the advantage — their estimate of costs was a reliable one. Because all the other new machines people came around [with] had new features, and were stretching something in the technology, their cost estimates were somewhat uncertain. History had shown that none of them had ever come in at less than twice the estimated cost. Now here, all we are doing is building a machine that was two miles longer. We were going to build a better machine, but there was no feature that was speculated, so you couldn’t say that we could make estimates. Our proposal was reviewed by outside consulting firms, and one of them came up with a ten percent higher estimate, but that was zero as far as the experience was — so we got the money. And you built your two-mile accelerator. That's right. There was also another feature which might be mentioned. All the major discoveries in recent years have been made with something called storage rings. You send particles around opposite sides and opposite directions, and inject them into these storage rings. They're not accelerated; they are just kept going. You inject them going this way, and particles going the other way, and they go around in a circular path. We can store them that way going around for hours. Even what's called a dense beam is really mostly vacuum, so if you have positrons here and electrons there, it's mostly space. When a group of electrons and positrons, go through each other, the number of collisions you'll get will be very very small, because it's mostly space. It's like taking two solar systems and having them pass through each other — the chances of one planet hitting another are very small. This is really a good analogy, except I think the space is even bigger — but if you do this for hours and hours you will get collisions. This is very important because you can get certain events happening, and with these particles going in opposite directions you have more energy available. These storage rings are filled by injecting accelerated particles from a linear accelerator. They're put into this thing and kept going in a circle because you have a magnet. While they go in a circle they lose energy because they radiate, and therefore you have to replenish them, but that's a trivial matter. You get the original energy from a linear accelerator, inject it into these storage rings, and by manipulating their orbits you inject them and keep them going in a circle. The first storage ring was built using the old accelerator we built, which is the 1GV, and it was successful. We did some very important experiments, and this was encouraging. There were lots of problems with whether these things would work, but the fact that it worked was encouraging. So the Stanford people asked for 125 million and they built SLC (the Stanford Linear Collider) and SLC has been very successful. The other machine was left and was still being used by people in the physics department. By this time, we had one laboratory called the Microwave Lab. That split around the early 1950s into the Microwave Lab and the High Energy Physics Lab, because the machine was left over in its building to be used by high energy physicists. The Microwave Lab continued doing research on other things, and we got our own building. The Microwave Lab got its own building, and you stayed with that? Yes. Ginzton was director of that. When they made the proposal to the government for the bigger machine, Ginzton said he'd be willing to supervise the construction of the big machine. So he was prepared to take an extended leave of absence from his other responsibilities to be director of construction while SLC was being built. The proposal went in around 1956, and I think we got the money around 1957. Somewhere around 1957 or 1958, Russell Varian, who had been Chairman of the Board of Varian Associates, died. The Varian Company wanted Ginzton to come in in some executive capacity. He had also become somewhat disenchanted with the idea of directing the construction of SLC not because of the technical problems, but because it involved continual interaction with government agencies, testifying in front of Congress — and he found that unpleasant. Congress was concerned with all sorts of unpleasant things — with royalties, and such — it was very complicated. Varian had invented this thing. Stanford had to have an agreement with Varian that any patent income was shared between Varian and Stanford. Stanford then sold the commercial rights to Sperry, and when Varian Associates got into the Klystron business, they had to pay royalties to Sperry to use their own patent! Some of those royalties they paid to Sperry, half went to Stanford, and Stanford split its royalties with Varian and the state. By this circuitous path, the government knew that somehow Stanford was getting royalties on the Klystrons that were going to be used in this thing. So there was an agreement that, unless especially asked to do so by the government, Varian would not bid on Klystrons. Ginzton did not want to be involved, and when Russell Varian died, he decided he was really more needed at Varian Associates. It was obvious he could've managed the construction very well. He took a sabbatical in 1957 and went to Varian in 1958. I was acting director of the laboratory in 1957, and it was called the Microwave Laboratory from 1958 on. I was director of that from 1958 to 1978, when I retired. Ginzton went to Varian, took a leave that was going to be for a few years, and never came back to Stanford. Now at some point, the nature of the work we were doing in the Microwave Lab changed. We changed our field of activity, we began working in lasers and acoustics and plasmas and so on. The Microwave Lab was no longer descriptive. The Laboratory was multi-departmental; we had people from electrical engineering and applied physics. (Some of us had left the physics department and formed an applied physics department.) We were doing work in lasers, and so “Microwave Laboratory” was no longer descriptive of the work we did. We couldn't call it the Applied Science Laboratory, because that was too much like Applied Physics, and it was not a departmental laboratory — the electrical engineering people enjoyed it, for various reasons, for the work they did. We had to find some other name. We in the laboratory — not Ginzton — decided to call it the Ginzton Laboratory, because we couldn't find a descriptive name, and it seemed quite appropriate to name it the Ginzton Laboratory. I forget when it was named that — maybe ten years ago. I was there under both names. “Microwave” from about 1957 and until about 1970 or 1971, I would guess. Up to that time we were still doing some microwave work, but somewhere around there we drifted out of it and into lasers, acoustics, doing superconductivity, and all sorts of things. The accelerator SLC was very, very successful. It was not only bigger but a better machine, because all the things that could've been improved in the original machine were improved, such as different fabrication methods. It was possibly in recent years the most successful accelerator in the world. They built the accelerator, and it worked very well. Then, I don't know how many years ago, we built the storage ring called SPR. The SPR ring was about 5GV. That means you had five billion volt electrons going in one direction and five billion in the other direction. The man who was in charge of the design and construction was a physicist who had come to Stanford, Burton, Richter, who's now officially the new director of SLC, as of two or three months ago. He came to Stanford to work on the first accelerator, the Binneyvault machine, and he had worked on the first storage ring. So when he went with the group that moved to SLC, in a few years they began to design and build a storage ring, which they did, which was SPEAR. SPEAR then did one of the most important experiments in the last twenty years, sometimes called the November revolution. About ten years ago they did an experiment and they discovered a new particle, and it couldn't have been done with any other machine except that. Well, that's not true. It had been discovered more or less simultaneously at Brookhaven using a different kind of machine. After the discovery of the particle, exploration of how it was produced it was only done here. The discovery of that particle won Richter a Nobel prize, because they decided that was something called a charmed quark. Some of the theoreticians said there was a whole set of particles which they had postulated, but which none of them had been seen. These quarks all fit nicely in a very elaborate and coherent scheme of explaining all the particles they did see. You could explain them all as combinations of quarks. A hundred different particles with all kinds of properties, you could explain them all as combinations of quarks, which had never been seen. If you postulated a certain set of particles' properties, you could combine them and get these things. There was a great deal of coherence, but some of the theoreticians said there are a few peculiarities, and if they could postulate one more kind of quark with certain properties then everything would fit pretty smoothly. This experiment that Richter did fit that scheme. The whole theory began to fit together in a way so that everyone believes in the reality of the quarks though they haven't been seen. Stanford has done a lot of experiments. I've given you a brief history. Not a complete history, because our lab went on to other things and was very successful in other fields we went into. I think you're somewhat interested in Fred Terman. Terman was strange man, peculiar — but those terms have negative implications. He was an unusual man, because in some sense Terman never showed any signs of self-aggrandizement. He never felt he was promoting things or pushing. He was not an easy man to deal with, but it’s not that he was harsh. He made up his mind about certain things and he would push. You could convince him otherwise, but he was very strong-minded. You never felt that he was promoting the welfare or aggrandizement of Terman. That seemed to come with the other stuff, and maybe he didn't have to deal with that. He was very controlling, because he had strong ideas of what he wanted to do. And you could talk to him and argue with him, but unless you presented a very good case, he would win. You could always see that he'd thought these things through very carefully. When I came here in 1947, he was just in the beginning of his reconstruction of electrical engineering and the engineering school. He supported people like Hansen, Ginzton and me; he very strongly supported what we were doing. For example, when I came here, we proposed that we were going to investigate building twenty or thirty megawatt Klystrons. This was a delusion of grandeur; we were experts in the field but we were proposing something that was grandiose. We believed it, because we thought that we knew what we were doing. But he supported us, and he had influence, [because] he had done enormous things during the war, important in running this laboratory. I don't know to what extent his influence got us our money. We wrote the proposals, and we argued, and so on. Hansen was well known, famous from World War II in terms of microwave and radar. Ginzton and I were certainly less well known. Both Hansen and Terman supported us in the university, in terms of getting us space and facilities and light teaching loads and whatever else was involved to get us going. You felt that Terman had faith — we were not the only ones, for whom he did this — he brought other people to the electrical engineering department. The electrical engineering department was totally reconstructed. He was not head of electrical engineering; by that time he was already dean, but there was no question who ran electrical engineering. Somebody who was head of electrical engineering took care of all the routine matters. Hugh Skilling? He was actually head during the war. During the routine running of the department, he did very well, but for the major decisions, such as who was going to be appointed, and so on, Terman was the man. He brought in Perrid. He didn't bring me here but I'm sure that he supported it if Hansen felt [I should come], so the whole electrical engineering department was reconstructed. During the war, most electrical engineering departments had very few people left, so he brought in a large number of young people. Villard’s undergraduate degree was in English. But he had already worked for Terman during the war, and had a job as an instructor and he was still getting his degree. Robert Helliwell, who has done some marvelous work in radio science in something called whistlers, didn't have his doctorate when he first came here and was an instructor. William Rambo came later, not until 1947 or so. He came around 1950-1951, and Terman was responsible for it. Yes. He was very good in his field, one of the first. He had worked at Bell Labs on traveling wave tubes, and he started a program in electrical engineering. He produced a great number of very good students: Dean Watkins, and a man named Tien. Watkins & Johnson. Watkins got his degree, went into industry, and was brought back here by Terman for the electrical engineering faculty. Then he left when he formed his company. Heffner, who got his degree here and went to work for Bell Labs, was brought back onto the faculty. All these people were students when I came here. I'm older than they are, so I came as an assistant professor in physics, but I taught a course which most of them took. Not Les Field, because he already had a degree, but all these other people. I gave a course in microwave tube theory. I have a list of ex-students that reads like a Who's Who of people in Microwave tubes. You had all these electronics engineers come through you. In a sense, you were an extension of the department. Terman must've known that, because he wanted these people trained that way, to become as good as the physicists. About a year or two after I got here I started teaching a course in microwave tube theory. Almost everybody who is now in a managerial [position] — the president of Litton Industries took this course, Watkins took the course, Heffner took the course, and somebody who is now a professor down at the University of California, Santa Barbara took the course. Stanford, in terms of universities, was the place for microwave tube research. It was Ginzton, myself, Hansen, and Les Field. We had large programs — Les Field had a large program, and then we did. Then we shifted, so microwave tubes were still important, but after a while the problems became so technological that you really couldn't do them very well, even though we had very technological facilities. We built our own tubes here, for the accelerator. Around 1963 through 1967 we sort of drifted out of microwave tubes. As I said, Terman supported us in all the things we wanted to do. At some stage, the physics department got involved in an internal set of problems, about what their relationship would be with SLC. It was going to be 125 million dollars to build the machine, and it was going to have an operating budget of about twenty-five million. It was to be a very big institution, much like the Brookhaven Lawrence Laboratory, and the question was what was going to be the relationship between SLC and the physics department. There was a considerable amount of disagreement among people who were then in the physics department, Penufsky and so on. A lot of the people in the physics department were worried that they would be overwhelmed if people from their faculty ran SLC and were also on the faculty. This was around 1960, and there was a question of whether students could do their thesis research under staff members of SLC who were not members of the faculty. This was resolved, but people like myself and Ginzton were not really involved in this controversy — we were not high energy physicists. We might've been involved in building the first accelerator, but we were not involved in building accelerators anymore. You were building that out of your microwave interests, it sounds like, and others came in and did the research with you. That's right. SLC was going to be built by another group. We were not all going to be involved in building SLC — maybe some of us would be. For example, I'm a consultant for SLC now, for the microwaves, and we were involved in some of their activities. The big problem was when SLC got rolling as a machine, and did high energy physics, which was one of the important fields in modern physics. They were going to have a permanent staff of physicists who were brought in to use the machine, to do physics. What was the relationship between these people and the physics department, about students? Could they teach? The physics department and the SLC people were involved in a long discussion. It was a controversy, a negotiation about what their relationship would be. Ginzton and I, at that point, were concerned about Stanford extending some of its activities in other fields, in which electrical engineering was not covered adequately — fields which fell in between. For example, plasma research, and maybe lasers. Solid state research. Solid state research in this country has been split somewhat between electrical engineering departments and physics departments. Certain kinds of it tend to be done in physics departments, and certain kinds tend to be done in electrical engineering. The more pure or far out tends to be in physics departments. We thought that this activity should be increased at Stanford, and possibly more of it should be done in the physics department. Electrical engineering was already expanding in that field, but they were going to go into things that were of more interest to electrical engineers — transistors and so on, less fundamental work, perhaps. When was this, the 1960s? This was about 1960 or 1961. Ginzton, Heffner and I felt that there should be more of this activity. We wanted more appointments in physics in solid state and in plasma. Physics was really to make an appointment or two. They made one appointment and then another, but they were then in the middle of their whole consideration of what their redirection would be with SLC. So, in some sense, what we were asking for was sort of a nuisance, because they thought it was unimportant, but it was something that was distracting them from things they were concerned about. So they were willing to go along to some extent, but not the farthest. We started wondering if maybe we should start to consider a separate department or a separate division or something. We had a long discussion with Terman, who was sympathetic to our interests. At that time, I did most of the negotiation, because Ginzton was on leave from Stanford because he was at Varian. Heffner was in electrical engineering. We had a long discussion about forming a separate entity, something that was separate from physics and electrical engineering. It would do what we call applied physics, which would require physics students for the research. It would also do something which might be relevant to electrical engineering but maybe not something which electrical engineering wanted to take on full-time. We had long discussions and so on, questions of forming a separate department, and we got Terman to agree. Terman was Provost at that time, so he had a great deal of influence on university policy beyond such things. He agreed, but he was worried because he felt [that] if we formed a separate department we might attract students that would normally go to electrical engineering, and he didn't want to weaken electrical engineering. We decided to get students to come into Stanford into the applied physics program who by and large were physics undergraduates. This was to attract a different group of students, and try to find an activity. So Terman agreed to provide us with some appointments and let us set up a separate division of applied physics. It was to be a graduate program, because we didn't want it to be competing with teaching undergraduate physics. It was to attract students who would do something which would not overlap too much with either physics department activity or electrical engineering. We would just see how it would work. About the time we started to form this, Ginzton was obviously not coming back immediately. So they were willing to give another appointment to us, which was actually a replacement for Ginzton, except that if he wanted to come back to Stanford, he'd still have an appointment here. We got two people. I was chairman of the search committee. We appointed two people for that one position, because I had two people I thought would be suitable for us. I said to the department, “They're both very good, they're different,” and they were generous. The two people I selected were Calvin Quait and Arthur Sholo. Quait hasn't won a Nobel prize, but he might! Both of these people were appointed just before we formed a separate division, and they had their choice. Quait came with us. He's an electrical engineer by training. Sholo is a physicist by training, but Sholo was working on lasers at the time, and lasers was one of the fields we wanted to get involved in. He did actually the first couple of years of work in our laboratory, because we had space for him. We formed the separate division, and we were reasonably successful, made some more appointments, and things worked out very well. We did various things. The important thing for Terman was that once we got the appointments, and formed a successful separate department, we were able to attract students, mostly physics students. Because of the way electrical engineering has developed as a field, there were a number of people in electrical engineering who found that they couldn't get the kinds of students that they wanted from the electrical engineering students admitted for graduate work. The training they were getting as undergraduates was suiting them for semiconduction information theory and all the things that had become important fields. People in electrical engineering who worked in lasers found they couldn't get students who had the proper background. So we would let our students do their research with any department, as long as it was something respectable and which could qualify as applied physics. A lot of our students did their thesis research with people from other departments, electrical engineering particularly. Thus we were able to take in many more students than our own department could handle. We did make additional appointments: we appointed two people who worked in superconductivity, and we got two solid state theorists. Terman supported us before we were successful, because he was willing to gamble on this thing. When we became successful he supported us, and we became a very successful department. By then he was so distant from things, in a sense, when he became Provost. But he had sort of a fondness I would say for the people he brought to Stanford in 1946-1950 or so. He was close to them, because he had brought them here, and by and large they were very successful. After that he still had an influence, but his most direct influence was in that period, when he brought these people into electrical engineering. He considered us his proteges. He was in on all the negotiations on the Microwave Lab, by the way. I haven't got up into the material. When you get hired, he's at RRL and they're asking his advice at every point. I don't believe that they would've brought you here if he.. hadn’t really had faith in you. He felt your serious war work was ten years ahead of anybody else. And that gave you that strength. I'm sure that he was influential in convincing the administration that they needed an extra assistant professorship, because they wanted to work on this. He had high regard for both Ginzton and Hansen, and if they thought that they wanted me, he took me, and we got to be very close. I would say that I was the principal agent in getting this applied physics department going. Ginzton was supportive, and his support and influence were important, but he was at Varian's. By that time, as far as Terman was concerned, I was the principal agent in authorizing this thing. He knew me well enough, he knew I'd been instrumental and involved in this accelerator, and the Klystron. I attended a technical meeting once, where I got up and talked about our plans, which were grandiose. There was a certain amount of skepticism in this specialized audience, and Terman got up and made some statements. He supported us when we were going on with this grandiose scheme on these megawatt Klystrons. And our laboratories in the years beyond that were very successful. By 1960 when we were trying to get another department, our laboratory had been very successful in microwave tubes. Our accelerator tubes, our Klystrons which were originally built for accelerators, had revolutionized the whole radar business the world over. Magnetrons are still used, but sophisticated radars use either Klystrons, which were an outgrowth of what we did, or traveling wave tubes which were originally a helix with Les Fields. That helix is a fine tube and it's still used, but if you wanted to go to very high power for various reasons it wasn't suitable. So we started out some work on trying to get traveling wave tubes which didn't use a helix. We used a different kind of structure, that looked like a Klystron but wasn’t. They had the properties of traveling wave tubes but had much higher power. Essentially everything which was later used was invented and developed in our laboratory. Ginzton and I knew — because we'd both been involved with radar during the war — what these Klystrons’ advantages might be. A magnetron had one advantage — it was compact and it was efficient for high power. It was small, it was an oscillator, which meant that you'd turn it on and off. It would not necessarily give you the same frequency twice. For radar, you'd like to send out a signal and get it back, send out the same signal and get the same frequency, and maybe keep the same frequency sound and phase and compare. You'd want to do so-called signal processing, to do very sophisticated things with the radar signals from when they're sent out to when you receive them back, and for that you want to have a controllable signal. Now you can do that with the magnetron only somewhat. It was obvious too for simple reasons that the Klystron is capable of much higher average power, or higher peak power. It's not as efficient as a magnetron, the average power of a Klystron is much much better for it, not because we were geniuses, but because we were lucky. That device, geometrically, can produce much higher power. There are Klystrons which will put out hundreds of kilowatts of average power. No magnetron will do that. You can make Klystrons, like ours that put out twenty or thirty megawatts of peak power. The Klystron and its descendant, and certain devices related to it dominate the field. I remember Ginzton and I convincing the people who were starting the Lincoln Lab at MIT. You were a consultant to the Lincoln Lab, weren't you? Yes, we knew them during the war. George Valley, Al Hill, and Matt Vorhees were all at the Radiation Lab during the war. We knew them, and they were all professors in electrical engineering at MIT. They were the people who organized Lincoln Lab originally for the Air Force. The whole Lincoln Lab was just a concept they were playing with. We said, “Look, we have built Klystrons for our accelerators. They're used for laboratory purposes only. You put a vacuum pump on them. We can build the same things, not at those powers, but we can build something at a megawatt, and these are the properties it'll have. We can build one for you if you can get us the money. If you're going to work with radar for the Air Force, you should have one started." So we actually got money from them, to build a one megawatt tube, which was going to be a sealed off tube so you could deliver it to somebody, when their laboratory was just a paper idea. Did they build the Lincoln Laboratory originally at Route 128 or was it on the campus? The organization was done at MIT but it was built in Lexington. Lincoln Laboratory was a set of buildings in Lexington, and the Air Force wanted to have a research laboratory to work on radar for them, managed by a university. The government has always had problems with its own laboratories. They've solved it accidentally, by having all these laboratories which are run for the government but not by them. They finance them. Sandia is run by Bell Laboratories; Los Alamos and Livermore are managed by the University of California. The University of California doesn't pick the technical program for Los Alamos. They have different ways of hiring the people, selecting managers, and so on. It's not part of the civil service. Lincoln Laboratories is managed the same way. That's right. Lincoln and the Instrumentation Lab are the two big labs at MIT, and they would be comparable to the Microwave Lab.